Use the If/Else Block to test for a condition and only run certain Blocks depending on the results of the test. Use the If Block’s condition to check active status for the account in the source data. Place an Update Block in the If clause to update the target data from the source data. 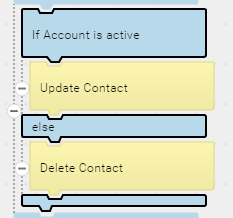 Place a Delete Block in the else clause to delete inactive accounts from the target data. Drag and drop the operation Blocks you want to use for your If/Else processing onto the workspace. Note that you can nest any Source or Target operations, as well as a For Each Child or even another If/Else Block. Change the labels to add more details about the If or Else operations. Note: You can leave either the If or Else clause empty. 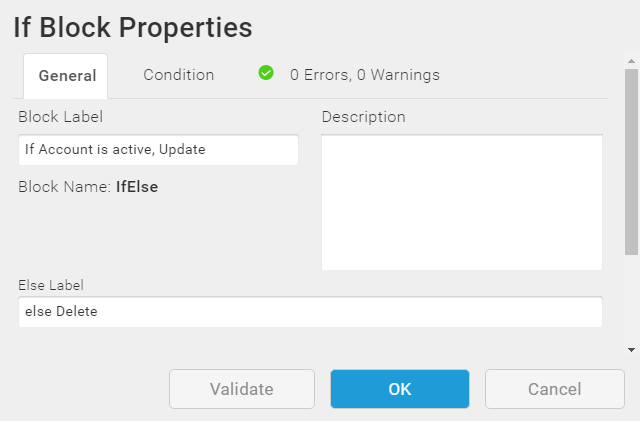 Select the Condition tab and define one or more Boolean conditions for the If/Else actions. The condition must evaluate to True or False. See Boolean Conditions below these steps. Note: If the condition evaluates to True, TIBCO Scribe® Online always processes the Blocks nested within the If. If the condition evaluates to False, the Blocks within the Else are processed. When you execute the Map, TIBCO Scribe® Online evaluates the condition(s) within the If/Else Block and branches depending on whether the condition evaluates to True or False. Note: Depending on your requirements, you can use the Result Fields to look at the results from a previous Block, such as a Lookup Block. After you drag and drop the If/Else Block into your Map, change the labels to add more details about the If or Else operations. Define one or more Boolean conditions. A Boolean condition is a statement that evaluates to either true or false. For example, does the value in the Name field equal "Dave". If the value does equal "Dave" the condition is true. TIBCO Scribe® Online uses the defined condition to determine the execution of the Map. The Conditions in the If/Else Block determine the set of Blocks to be executed. If the rule has both AND's and OR's, all of the AND's are evaluated first. In the example below there are several combinations of data values that would to evaluate to True.